MTU is counting to the leading manufacturers of large diesel engines in the world (20 up to 9.000 kW), for example for ferries and working vessels, machinery for railways, heavy duty vehicles and for power generators. MTU company in the German town Friedrichshafen is nearly 100 years old now. The origin was the MAYBACH-Motorenbau company. 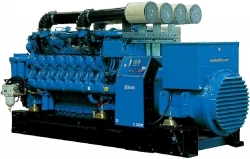 MITTRONIK offers generators sets powered by slow turning MTU diesel engines in a range from 600 up to 3.000 kVA.